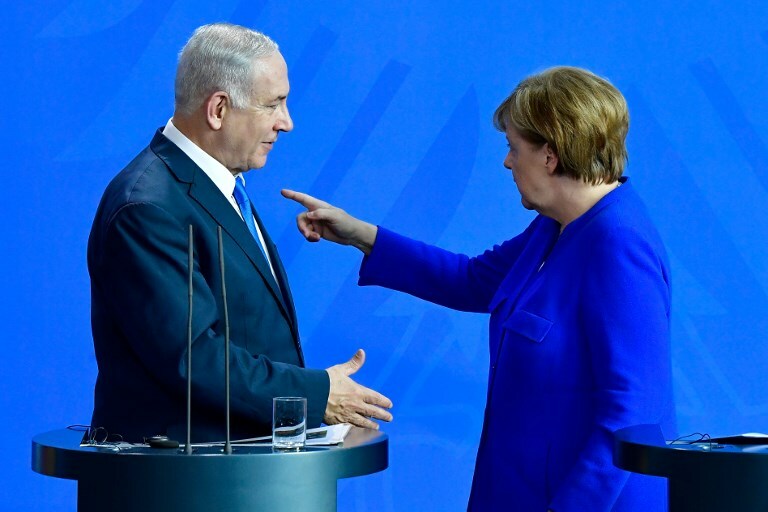 German Chancellor Angela Merkel on Monday told Prime Minister Benjamin Netanyahu that she agreed with Israel’s demand that Iranian troops be removed from Syria, especially the area close to the Israeli border. “Iran’s regional influence is worrying,” she said. Announcing at a joint press conference in Berlin that she and other government representatives planned to visit Israel in early October, Merkel said that “one has to discuss” Tehran’s presence in Syria. She also condemned the Islamic Republic’s heavily anti-Israel tweets. Still, Merkel defended the nuclear deal signed in 2015 by Iran and world powers — and opposed all along by Israel — arguing that it made the world a better place. US President Donald Trump withdrew from the deal on May 8, with Netanyahu’s enthusiastic encouragement and support. Both the US and Israel hope that Trump’s withdrawal can lead all sides into addressing what they say are the deal’s shortcomings — including “sunset” provisions that eventually end restrictions on Iranian nuclear activities, such as enriching uranium, as well as permitting Iran to continue to develop long-range missiles. Merkel, like other European leaders with whom Netanyahu is set to meet later this week, has urged Trump to remain in the deal, known as the Joint Comprehensive Plan of Action. As he took off for Berlin on Monday, the first leg of a series of visits with European leaders, Netanyahu indicated that Iran would be the first and only subject on his agenda. Intent on winning support for amending the nuclear deal with Iran and getting Iranian troops out of Syria, the prime minister will also meet with French President Emmanuel Macron and British Prime Minister Theresa May, both of whose countries are signatories to the deal. At Monday’s press conference, the two leaders agreed that it was important for the International Atomic Energy Agency to review a secret Iranian nuclear archive that Israel smuggled out of Tehran earlier this year and which Netanyahu announced to the world with great fanfare at the end of April. Netanyahu warned Merkel that Iran’s presence in Syria should also worry Germany, given that Shiite militias there were intent on converting Sunni Muslims to their creed, with the result that a “new religious war” would break out in the Middle East and send further waves of refugees to Europe. Israel fears that as the Syrian civil war winds down, Iran, whose forces and Shiite proxies have backed President Bashar Assad, will turn its focus to Israel. The Israeli Air Force is believed to have carried out a number of airstrikes on Iranian positions in Syria. Last month, the bitter enemies openly clashed when Iran fired dozens of rockets at Israeli positions in the Golan Heights, and Israel responded by striking several Iranian targets in Syria. While the German leader reiterated the need for a two-state solution, Netanyahu said there would be no progress until the Palestinians recognized the right of the Jewish state to exist. This entry was posted on June 4, 2018 at 6:45 PM and is filed under Uncategorized. You can subscribe via RSS 2.0 feed to this post's comments. You can skip to the end and leave a response. Pinging is currently not allowed.